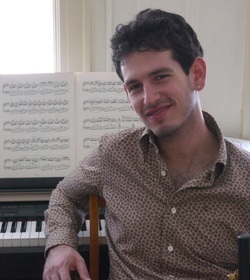 "Yaron is a wonderful saxophonist, a part of the next generation of Jazz." Originally from Israel, Mr. Elyashiv has already been making a name for himself after only four years in New York, leading his groups at the legendary Minton's Playhouse, Silver Spring Jazz Festival, NAACP 100th Anniversary, Barnes & Noble, and a live radio broadcast at the WBGO studios in Newark. Some of the clubs he performed include Smalls, The Carnegie Club, Cleopatra’s Needle, Swing 46, Saint Nick's Pub, Fat Cat, Jules Bistro, as well as The CUNY Jazz Festival. Mr. Elyashiv has performed and recorded with great musicians such as Ugonna Okegwo, Billy Drummond, Kengo Nakamura, Phil Stewart, Andrei Ryabov, Noah Haidu, Ruslan Khain, Satoshi Inoue, Ari Roland, Sacha Perry, Will Terril, Daniela Shaechter, Tommy James, Bertha Hope, Myrna Lake, Dmitri Kolesnik, and Richard Clements. In 2007, Mr. Elyashiv was invited to record with veteran jazz singer, Myrna Lake, on her latest album Yesterdays. Just a few months later he released his debut album as a leader entitled I Remember You, for Jazzing Music. The album has been praised by Edward Blanco of eJazzNews.com as “a sparkling musical statement,” hailing his performance as “outstanding.” Larry Taylor of JazzReview.com adds, “His soloing and improvisational skills bring to mind legendary greats Dexter Gordon and Sonny Rollins.” Anchor Dan Karcher of WBGO radio station sums it up, "Yaron is a wonderful saxophonist, a part of the next generation of Jazz."